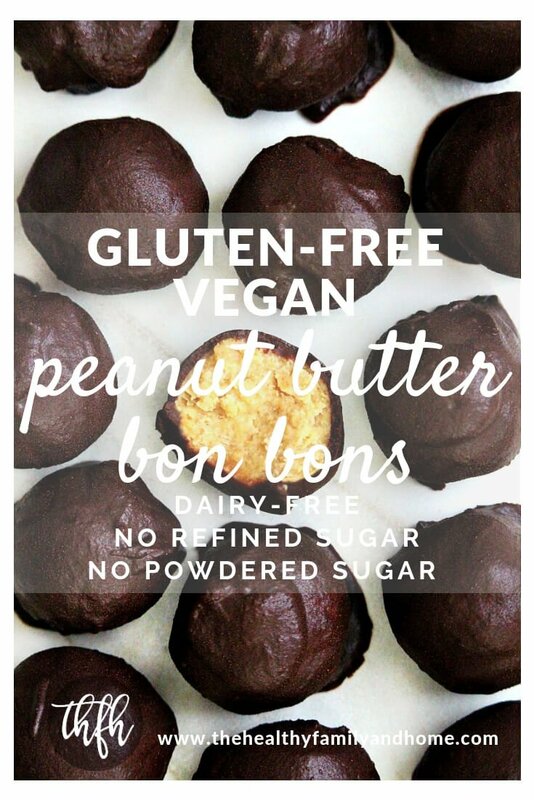 These homemade Healthy Gluten-Free Vegan Peanut Butter Bon Bons are an easy and healthy recipe made with only 5 clean ingredients, no powdered sugar, and taste so much better than store-bought candy! 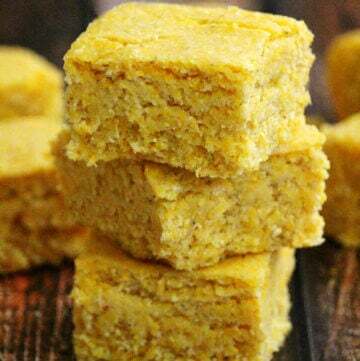 They can be prepared in about 10 minutes and are vegan and gluten-free! These homemade Healthy Gluten-Free Vegan Peanut Butter Bon Bons are also known as “Copycat Reese’s Peanut Butter Eggs” and “Vegan Peanut Butter Eggs”, but they are all the same and are perfect when you want a little bite-sized chocolate + peanut butter treat. I love them because not only do they have the chocolate + peanut butter combination, but also contain healthy fat from coconut oil which I try to get in a serving each day. 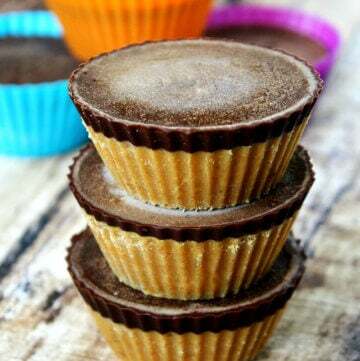 If you want to try another chocolate + peanut butter treat, make sure you check out my Healthy Peanut Butter Cups recipe! Both recipes would be great to use with my homemade peanut butter recipe and are super easy to make, even if you’ve never made your own peanut butter. The organic coconut flour I use is from Thrive Market and is one of my favorite gluten-free flours to use. 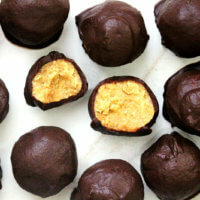 Are These Healthy Peanut Butter Bon Bons (aka “Reese’s Peanut Butter Eggs” + “Vegan Peanut Butter Eggs”) Really Healthy? The store-bought candy contains GMO ingredients (soy and dairy), refined sugar and salt, and preservatives. Also, non-organic peanuts can contain up to 8 different pesticides. And some homemade versions are made with powdered sugar, shortening, and even milk and butter. 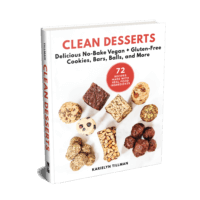 When you make your own clean homemade desserts, you have control over the ingredients that are used and can make them without any of the ingredients found in store-bought candies like artificial colors, flavors or chemicals. This healthier version is made with organic, real food ingredients and is vegan, gluten-free, dairy-free and contains no refined sugar. 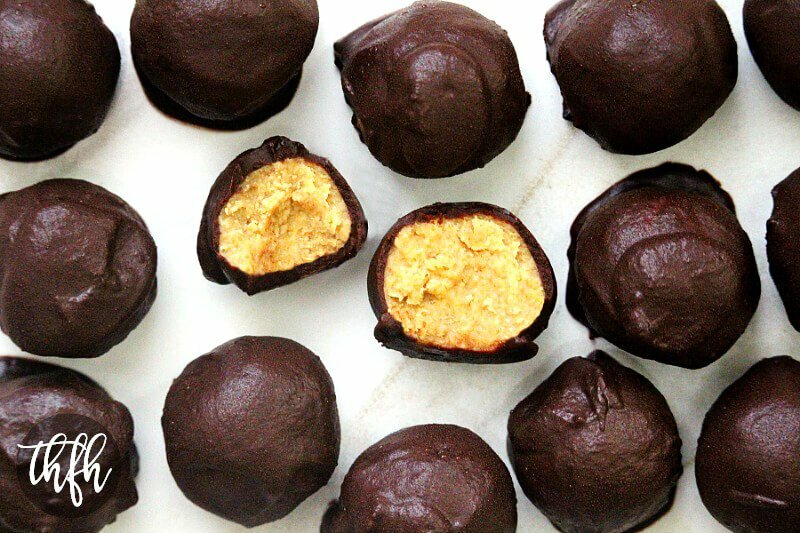 Can You Freeze These Healthy Peanut Butter Bon Bons (aka “Reese’s Peanut Butter Eggs” + “Vegan Peanut Butter Eggs”)? Yes! 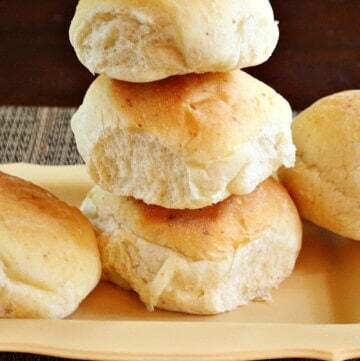 In fact, they need to be stored in the freezer or refrigerator until ready to serve because they will get soft and lose their shape if left out at room temperature. Just store them in an air-tight container and they will be ready at a moments notice whenever you need a healthy treat! What Ingredients Do I Need To Make Healthy Peanut Butter Bon Bons (aka “Reese’s Peanut Butter Eggs” + “Vegan Peanut Butter Eggs”)? These are super easy to make and they can be prepared in under 10 minutes! Prepare the peanut butter balls. Just add all the ingredients for the peanut butter balls to a medium-sized bowl and stir everything together until it’s well combined. Depending on the type of peanut butter you use, you may need to add more or less coconut flour than what is shown in the recipe. I always start with a 1 tablespoon of coconut flour. Coconut flour is very dense and too much is not good. But you also need enough to make the balls firm, so it’s kind of tricky to get just the right amount. My suggestion would be to start with 1 tablespoon and add an extra 1 tablespoon at a time until the balls are firm enough to roll into a ball shape. If you want to make these in an “egg” shape, just roll them into an “egg” shape instead of a ball shape. Shape the balls. Next, you’ll take out a spoonful at a time and roll them into a ball shape and place them on a cookie sheet lined with parchment paper. 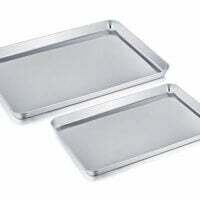 Then you’ll place the cookie sheet in the pan for the balls to chill while you prepare the chocolate coating. Prepare the chocolate coating. In this step, you will be melting the ingredients for the chocolate coating. Since I don’t use a microwave, I just add the ingredients to a small saucepan and melt everything on the lowest heat and stir until it’s smooth. Assembly. Remove the cookie sheet from the freezer and dip each ball into the melted chocolate coating and place them back on the cookie sheet. Return the cookie sheet to the freezer so the chocolate can harden for about 15-20 minutes. You’ll want to store them in an air-tight container in either the freezer or refrigerator until ready to serve because they will get soft and lose their shape if left out at room temperature. Want More Healthy Chocolate + Peanut Butter Recipes? 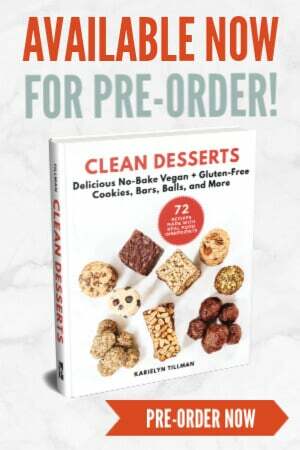 My CLEAN DESSERTS Cookbook with 72 No-Bake Vegan + Gluten-Free Dessert Recipes made with real food ingredients just like this one that you will love! 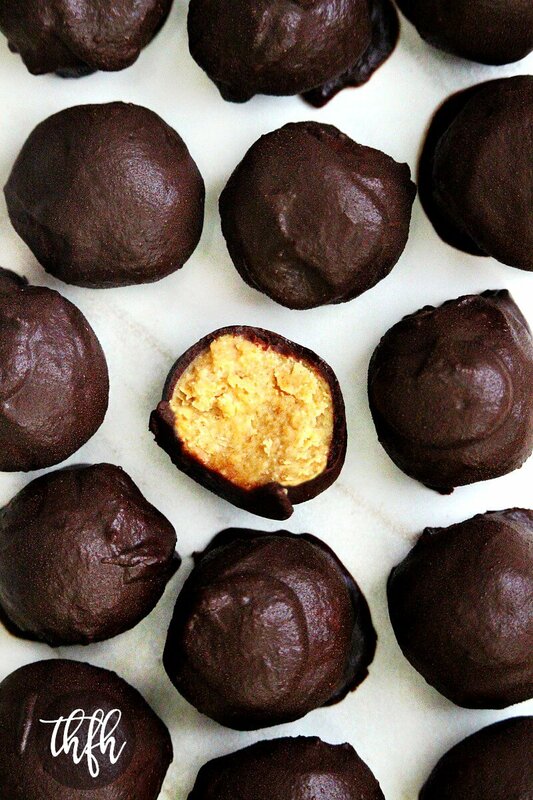 Did You Make My Healthy Peanut Butter Bon Bons Recipe? 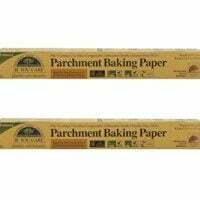 Prepare a cookie sheet lined with parchment paper. Set aside. Take out a spoonful at a time and roll into a ball shape. Place the balls on to the prepared cookie sheet and place in the freezer to chill while you prepare the chocolate coating. Add all the ingredients for the chocolate coating to a small sauce pan and melt on lowest heat, stirring the entire time until it's melted and smooth and taking care to not let it burn. Remove the cookie sheet from the freezer. Dip each peanut butter ball into the melted chocolate coating, gently tossing to make sure the entire ball is covered and remove with a fork to allow any excess chocolate to drop off. Place the balls back onto the cookie sheet and return to the freezer for approximately 30-60 minutes, or until the chocolate has hardened. 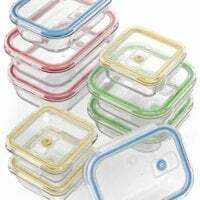 Store in an air-tight BPA-free container in the freezer or refrigerator until ready to serve because they will get soft and lose their shape if left out at room temperature. 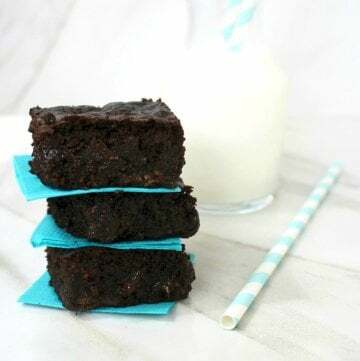 *Substitute with sugar-free liquid sweetener and sugar-free chocolate chip keto-approved ingredients. Where To Buy: Get all your organic ingredients delivered straight to your door at up to 25-50% off retail by cutting out the middleman and retail markups with a Thrive Market Membership and save 15% off on your first order. Copyright Notice: The recipe and photographs for "Gluten-Free Vegan Healthy Peanut Butter Bon Bons (aka Reese's Vegan Peanut Butter Eggs)" by Karielyn Tillman of The Healthy Family and Home website are copyrighted material and are protected by the Digital Millenium Copyright Act (DCMA). They cannot be used legally without my written permission. Affiliate Disclosure: This post contains affiliate links. This means that if you were to make a purchase through one of these links, "The Healthy Family and Home" website would receive a small commission at no additional cost to you. Amazon Disclosure: "The Healthy Family and Home" website is a participant in the Amazon Services, LLC Associates Program, an affiliate advertising program designed to provide a means for sites to earn advertising fees by advertising and linking to Amazon.com. Thank you for your support of this website! The information shown is an estimate provided by an online nutrition calculator. It should not be considered a substitute for a professional nutritionist's advice. Can I use AP flour instead of coconut flour and unsweetened cocoa powder instead of raw cacao? Hi there Kylee! 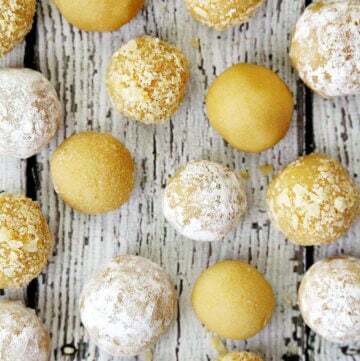 I haven’t made the recipe with any other type of flour, but I used the coconut flour just to firm up the peanut butter balls enough to be able to roll them into a ball shape. Since it’s such a minimal amount, I would try it and see how it works. And, depending on the type of peanut butter you use, you may not even need to add any at all, especially if your peanut butter is on the thicker side. And yes, you can definitely use unsweetened cocoa powder instead of raw cacao. I love your recipes but my husband has a coconut allergy. What can I substitute for coconut sugar? – Coconut oil: You might can skip this completely, I would try. 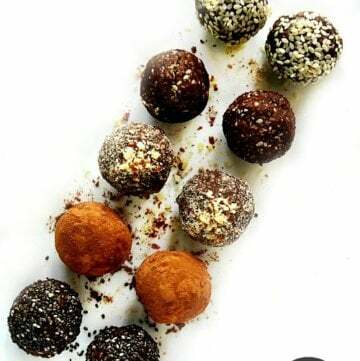 Just omit from the peanut butter balls and instead of making the raw chocolate topping with the coconut oil, you could substitute those ingredients and use Enjoy Life mini-chocolate chips. Just melt them on lowest heat and stir until it’s smooth and creamy. Hi there Ella! 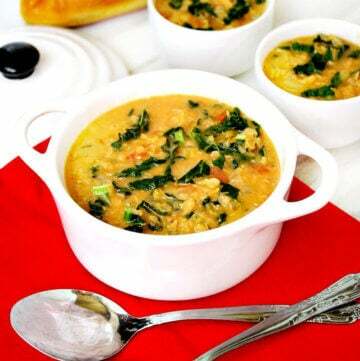 I’m so glad to hear you enjoyed the recipe and made them for a big event! They will be fine for a week (or even longer) but I would keep them in the freezer in an air-tight container. Also, it is very important to keep them cold/frozen while transporting them and until time to serve them because of the coconut oil. When it is cold, it will stay hard but when it’s exposed to room temperature, it will melt and so will the bon bons and you will have a big mess on your hands. Just keep them cold and put them out ~right~ before you need to serve them and put them away (if there’s any left!) as soon as you can. 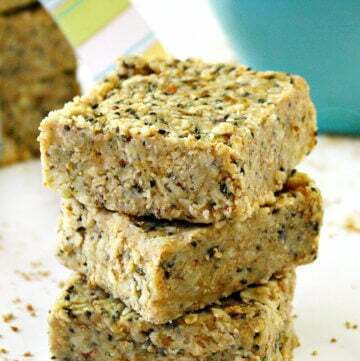 Can you use almond flour or sorghum flour instead of coconut flour? Hi Sharon! I’ve never used sorghum flour, but if it is a neutral flavored flour, I’m sure it would be fine. Another one that would probably work well is almond flour, if you like that. 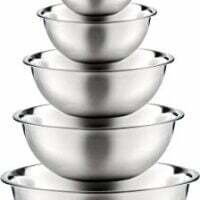 Just make sure you adjust the amount enough to get them into a slightly firm ball shape, as shown in the photo above. That will make them hold up better when you put the chocolate coating on them. Do you have the nutrition facts on these???? Hi Tonette! I’m sorry…I don’t show the nutrition facts for my recipes and here’s why. When I ate the SAD (Standard American Diet), I ~always~ counted calories of every crumb that went into my mouth. And to no avail – I could never lose weight. Ever. No matter what I did. In fact, I just kept gaining weight. It wasn’t until I started juicing, eating raw foods, fruits and veggies, nuts and seeds, and healthy fats, AND eliminated grains, processed sugars, toxic salt and processed foods did I finally started losing weight. During a short period (90 days) when I ate 100% raw, I ate ~whatever~ I wanted, whenever I wanted and still lost 18 pounds. Once my body started getting nutrient-dense, live foods with high-quality fats, the weight just started falling off. For me and my body, when I eat the right foods, calories just don’t matter. Anyway, I inputted the ingredients in a nutrition calculator for you and came up with the following for (1) ball: calories 112, carbs 9, fat 8, protein 7, sodium 3, sugar 5. This was based on the recipe making 14 balls. Don’t forget that the ingredients and nutrients in a food are just as important as calories and carbs….you could have a food with low calories and carbs, but are the ingredients clean and do they provide your body with nutrients it needs? Or are they highly processed, full of GMO’s, preservatives and chemicals?